In our living room we have a wood stove (our dearest winter love) and behind it, about a foot away on the wall going up about halfway, we have black tiles with white grout (my husband’s biggest pet peeve in the home) as a sort of “firestop”. So finally, this year, we are hoping to getting around to putting in something more attractive. We’ve been thinking of replacing the tiles with smooth round river rocks, which we can get cheaply nearby. We had also thought of putting in an artsy copper tree silouette, since my husband is a metal artist. But today I saw the above photos in an article about mud/plaster in home decor, and I am sold. Well, most likely, I will not be on the roof anyways, as someone will have to watch our dear little tornado, I mean, toddler. So maybe I’ll get to build that wall after all… In the meantime, color me inspired! Today my partner and I received a call from the local paper wanting to do an article on us, and they came in right away for the interview. Apparently, they heard that our small “Natural Health Center & New Age Store” belongs to one of the few sectors that is still doing well in this economy, and that lots of people are turning to stores like ours to talk to psychics. Ha ha — we wish! Our store started tanking over a year ago, when the economic downturn was just beginning. We have, however, been slowly climbing back out of the hole for the last four months or so. We each work about 25 hours a week at the store, and have been taking home a whopping $200 a month. It’s a labor of love people, and boy, what a looooong labor it has been! But the woman was, in a way, right… I’ve noticed three things over the past months among our customers, both of which are good trends. First, I see a lot more people coming in looking for self-help books, or metaphysical books that will help them get “tuned it, tapped in and turned on” to their inner beings. People are seeking to know themselves better, and understanding that this will help them go with flow better, which in turn will lead to them a better place, both spiritually and economically. Second, there has actually been a decrease in our traffic for the psychics or intuitive counselors, while there has been an increase in traffic for all our energy healers. People are seeking to better align themselves energetically, looking to learn how to be in balance with themselves and their surroundings. This can only lead to better things, for them, and for the world. And, third, there has been an increase in people buying gifts for other people. Rather than thinking of themselves, the majority of people are looking for little ways to make their friends and families feel better. This is a grassroots compassion movement, and I for one am ecstatic to see it surging. To help it along, we have offered our customers a 2-week “spread the love” 25% off sale on all retail items in the store. Not because we need to move merchandise, which most sales in retail are motivated by, but because we want to help make it possible for this compassion movement to continue. Monday is baking day in my household. Not so much out of routine or necessity, but somehow, I always seem to bake on Mondays. After spending the weekend with my husband and son, taking it easy, I find that Monday is a restful day, and I usually feel like I’d like to do something nurturing for my husband to show I care in a little big way. Something to show him how much I appreciate him, and miss him when he goes back to work. Baking, to me, is one of those things. Sometimes its just cookies, others its bread, or maybe a quiche or empanadas. Sometimes its all of them. Always, Monday seems to involve flour. Today my son and I are baking a simple whole wheat and unbleached white wheat bread. Actually I’m making two loaves, one to eat this week and one to freeze for next week. We found a gorgeous breadbox at the goodwill yesterday for $3, so I am looking forward to seeing if it makes a difference in the bread after a day or two. Luke really loved kneading the dough, and getting shoulder deep in the flour. This recipe is a basic european recipe that I found in Carla Emery’s Encyclopedia of County Living, which I received for Christmas. I am in love with this book, and am reading it cover to cover, all 928 pages. I think i am about 1/3 of the way through now. If you are interested in living off the land, homesteading or just learning more about how to make things from scratch, this is THE book to get. It has everything. I have several other “homesteading” books, but none of them hold a candle to this one. This morning I found out that the Department of Agriculture is pressuring my beloved state of CT to put much stricter regulations on raw milk, including requiring all sales to be on-site. All the farmer’s are up in arms, and the consumers too. If we have to start buying our milk on site, we will have to drive 30 minutes each way to get it, which is just silly. The hearing is tomorrow, and I have written about 50 people on the committee about it, and signed a petition. I wish I’d known earlier, so I could have arranged to be at the hearing — and I am surprised we didn’t know, since my husband is a retail distributor of raw milk. He sells to about 6 people a week, but the farmer never told him. Ah well. Wish our farmers luck! 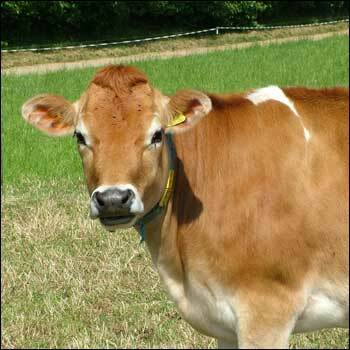 We love our raw milk, which we’ve been drinking going on 4 years now, and selling for 3. My husband doesn’t mark it up at all, nor do most of the grocery stores around here who carry it, they just like to offer it to their customers. For my husband, who runs a auto repair shop and convenience store, he had a dairy license and began carrying the milk so we wouldn’t have to drive so far to get it. And talking to fairies. And Devas. And animals, insects and plants. Over the last few years I have been doing a lot of research on co-creative gardening. This is the sort of gardening that made Findhorn, that gardening miracle, possible, and that fuels most flower essence companies today. Rudolf Steiner and biodynamic gardening have also embraced the idea of co-creation. Some great books about this are “Behaving as if the God in all life mattered” and “To hear the angels sing.” Both books have very Christian titles, but no dogma lies withing their pages. The writing is entirely about communing with nature — which necessarily connects you to Source energy, and the realization that All is One, and so, yes, God is everywhere. In essence, you relax your mind, and open yourself to communication with the nature spirits on your property. Some people do it through meditation, others sit down with a pen and paper and let the words flow. Myself, I like to sit at the computer. You’d be amazed at how much information they have to share with you, and how much easier it can be to maintain your land when you pay attention to what they have to say. On my own land I have recieved instructions on how and when to fertilize (clean wood ash in the fall, and compost in the spring. Mulch with 6-10 inches of hay, never need to water again) and what the ants would like in exchange for not invading my home each spring (a small bowl of sugar in a sheltered spot outside in the garden). I have talked with a huge swarm of honeybees and had them agree to build their nest in the woods bordering our property in exchange for free access to the yard (after this, even the yellow jackets behaved sweetly.) I have been asked to leave an area that was covered with toxic dolls-eye bushes wild for one summer, and told that the next year I could clear it without the doll’s eyes returning. That “wild” summer, the other plants took over the doll’s eyes, choking them out, so that they never went to seed, and now the area is cleared and a safe, favorite place for my young son to play. Now, they’ve given me instructions and reassurances on how to fix my roof, where and how to plant new crops in the spring, and where to place a solar collector for hot-air heat on the house. Somedays, for fun, we like to go out and take pictures of the property. And Sometimes, the nature spirits show themselves to us in the photos. There’s one in the upper left of the banner for this blog, and here are some more for you to enjoy. Their message is always the same: Be joyful. Be joy-FULL. Be in love, and know that you are loved. All is one, and you are one with Spirit, with Source. All will be well. Every year about this time I begin looking at solar options for our home. With visions of tax returns and sunny days looming in my head, its only natural. In the past I’ve focused on solar power, which we haven’t been able to afford — Even the small arrays haven’t been cheap enough. This year, I’m looking into the possibilities of a passive solar collector/warm air heater, which we could build for a few hundred dollars, and/or a solar cooker. While a solar cooker is a very cool idea, it’s the solar heater that I am most enamoured of. The idea is to build a shallow, big box made with corrugated fiberglass (like on greenhouses) and black paint inside. Nail it to your south wall or roof, and let it collect the sun’s rays. A small vent into your home, equipped with a blower fan, is all you need to bring the sun’s heat into the house. Sounds like a no-brainer, right? Well, here’s the thing. We live on the east side of a mountain. To the the south and north of us, we are bordered by a nature preserve: lots and lots of trees. In December the sun hits our property directly for about one hour. Today, we are getting a couple hours of sun — this sun is all filtered through the naked trees. Not too good for solar collection. But this morning I looked up at the roof, and saw that although the ground around our one-story house is getting minor rays, the roof is high enough to be getting full sun. So I think the solar collector may be a go! At the very least, it could definitely heat our house in October, March and April, when we usually burn the wood stove several hours a day to take the chill of at night and in the morning.